-!!! '02 Driveshaft In Excellent Refurbishing to New Condition - Offered As a Service !!! Here is an Nice Straight, "FULLY-REFURBISHED" '02 Part From Inside Current '02 Parts Inventory of #2,300+ Parts. 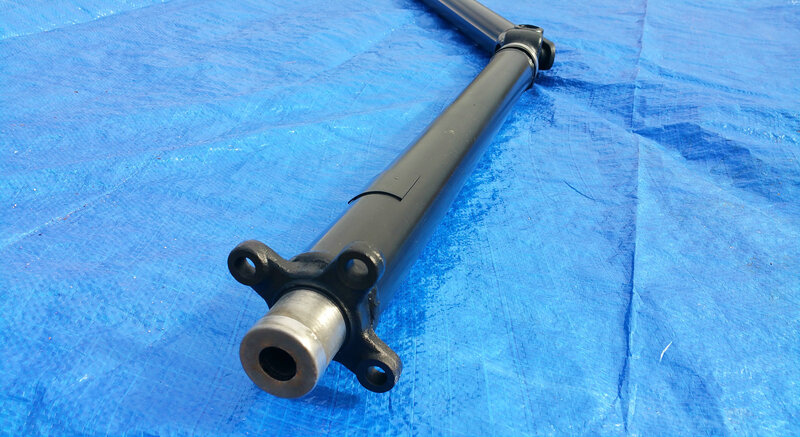 Important 2002 Drive Train Component That Often Times Needs Attention, Repair OR Replacement -- The Driveshaft. !!! DRIVESHAFT RESTORATION INCLUDES AN ACID-WASH BATH FOR 2-WEEKS TO COMPLETELY REMOVE OLD PAINT & RUST !!! !! 2ND-STEP INCLUDES REMOVING THE RUBBER FLEX CENTER & OUTER CASE OF DRIVESHAFT CENTER SUPPORT BEARING !! !! 3RD-STEP INCLUDES REMOVING ANY OTHER IMPERFECTIONS / BLEMISHES OF HAND SANDING WITH 2 GRADES #180/220 !! !! 4TH-STEP INCLUDES ETCHING METAL + APPLYING THREE SEPARATE COATS OF VHT HIGH-TEMP SEMI-GLOSS BLACK PAINT !! !! THE 9.0 CONDITION REFURBISHED DRIVESHAFT WITH 3-COATS OF PAINT = ONLY $185 WHICH IS A KILLER!!! PRICE : ) !! AWESOME VALUE COMPARED ELSEWHERE = "TAKE-UP-TO" -85% OFF VERSUS "NEW" SAVING $465 OVER ONLINE SOURCES !! Currently Low On M10 Motors, Headlights & Tail Lights -- Have Several E-12 Heads and one 121 Head Casting (No Valves, OR CAM), Intake Manifold, Six Pedal Boxes, Three Steering Boxes, Seven Consoles, Eleven Sets of USA Turn Signals, Six Valve Covers, Eight Radiator Fans, Dozens of Vent Knobs, Vent Window Actuators, Chrome Door Finishers, Quarter Chrome Finishers, Chrome Vent Window Frames, Sport Wheels, Steering Wheels, 4-Speed Trannies, Drive Shafts, CV Half Shafts, Hubs, Subframes, Window Glass, Loads Of Belt Trim, Lower Body Trim, Plenty Of Sheet Metal = Doors, Hoods, Deck Lids, Quarter Panels, Tail Clips, Nose Clips, Window Regulators Door Hardware, Seat Belts, Grills, Lights, Brackets, Linkage, Switches, Relays, Trim, Gaskets, and Much, Much, More. Unfortunately, NO DOOR GASKETS, SQUARE TAIL LIGHTS, NON-CRACKED DASHBOARDS At This Time. 1.) ALL '02 ITEMS ARE ON A 1ST-COME-1ST-SERVE" BASIS. 2.) REQUESTS ARE HONORED IN THE ORDER THAT THEY ARE RECEIVED. 3.) PAYMENT IS DUE WITH PACKAGING, NOT BEFORE. Hood Center Trim Piece Shipping Cost Will includes a $12 Tube from Home Depot plus $15.45 for USPS Priority Mail Shipping to 2-3rd's of Country. East Coast will be approximately $5 more. Parcel Select Service will be a few Dollars less. "If It Fits – It Ships"
Large Packages between 60 lbs. and 100 lbs. may ship FedEx Ground. Larger shipments heavier than 100 lbs. are sent via Common Carrier with Pilot Freight who has 75 warehouses in major cities around the country. Every Single Package is Shipped with Insurance.